Liberia’s president-elect George Weah vowed Dec. 30 to “improve people’s lives” after the former star footballer secured a stunning run-off victory in the country’s first democratic transfer of power in decades. Idolized in Liberia as “Mister George,” Weah is to be sworn in on Jan. 22, replacing Ellen Johnson Sirleaf, who in 2006 took the helm of the West African country first founded for freed U.S. slaves. The electoral board confirmed Weah’s run-off victory on Dec. 29 evening, as his rival, Vice President Joseph Boakai, conceded defeat. In his first public comments since his victory, Weah told journalists in Monrovia he aimed to “improve the lives” of Liberians. “I declare publicly today that transforming the lives of all Liberians is a singular mission,” he said. A victory speech was however postponed after crowds of energetic supporters gathered around a podium for Weah’s address grew too boisterous. Weah, 51, who starred in top-flight football at Paris Saint-Germain and AC Milan in the 1990s and briefly at Chelsea and Manchester City before entering politics in 2002, won 61.5 percent of the ballot, taking 14 of Liberia’s 15 counties. The tumultuous events of the past 70 years in Liberia, where an estimated 250,000 people died during back-to-back civil wars between 1989-2003, have prevented a democratic handover from taking place since 1944. Sirleaf’s predecessor Charles Taylor fled the country in 2003, hoping to avoid prosecution for funding rebel groups in neighboring Sierra Leone. Two presidents who served prior to Taylor were assassinated. The Sirleaf administration guided the nation out of the ruins of war and through the horrors of the 2014-16 Ebola crisis, but is accused of failing to combat poverty and corruption. Manchester City midfielder Yaya Toure and Marseille’s former Cameroon midfielder Stephane Mbia also sent their best wishes. 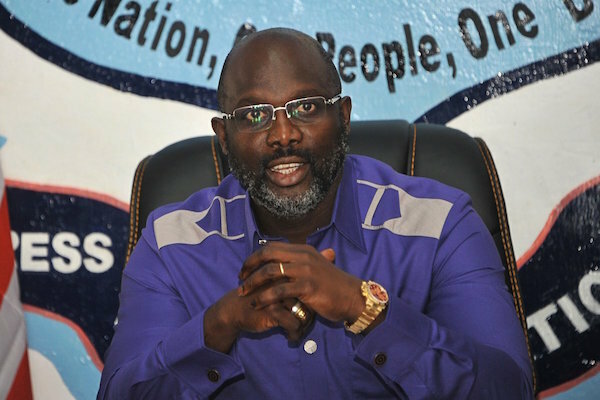 Weah, who grew up in grinding poverty, is already facing pressure to improve the lives of millions of Liberians. “I think the Liberian people will expect… Weah’s presidency to [have a] pro-poor, pro-growth policy that will put the people at the center of national development,” said political analyst Vita Ishmael Tue. Weah, the only African ever to have won both FIFA’s World Player of the Year and the coveted Ballon D’Or, missed out on the presidency in a 2005 bid. His latest campaign was not without controversy, however. He has drawn some criticism for picking Jewel Howard-Taylor, the powerful ex-wife of former warlord and president Charles Taylor, as his vice-president. Taylor is serving a 50-year sentence in a British jail for war crimes. Weah also had the backing of a notorious former warlord Prince Johnson, who sipped a beer as his men tortured former president Samuel Kanyon Doe to death. Happy New Year How I Got My Ex Husband Back………..